The citron-crested cockatoo (Cacatua sulphurea citrinocristata) is the same species as the Lesser Sulphur-Crested cockatoo (Cacatua sulphurea sulphurea). The citron-crested cockatoo is classified as a subspecies of the Lesser Sulphur-Crested cockatoo. In appearance both species look alike, except for some striking differences. The crest of the citron-crested cockatoo is orange instead of yellow and it also has an yellow cheek mark that the Lesser Sulphur-Crested cockatoo lacks. In captivity both species are interbred often, producing hybrid individuals with traits of both subspecies, making it harder to see which species you are dealing with. Pure bred citron-crested cockatoos have become rare in captivity. 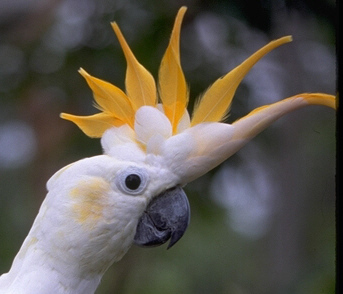 The Citron-Crested cockatoo occurs naturally at the island of Sumba in Indonesia. They live in tropical forests or on the edges of these forests. This species is endangered because it’s existence is dependent on it’s natural habitat on the one island it occurs. If the natural habitat of the citron-crested cockatoo is destroyed, the species will be lost. In captivity the citron-crested cockatoo is still being kept and bred. The problem in captivity is that the citron-crested cockatoo and the lesser sulphur-crested cockatoo can interbreed. Their offspring is healthy and can reproduce again, as both types of cockatoo s are the same species. 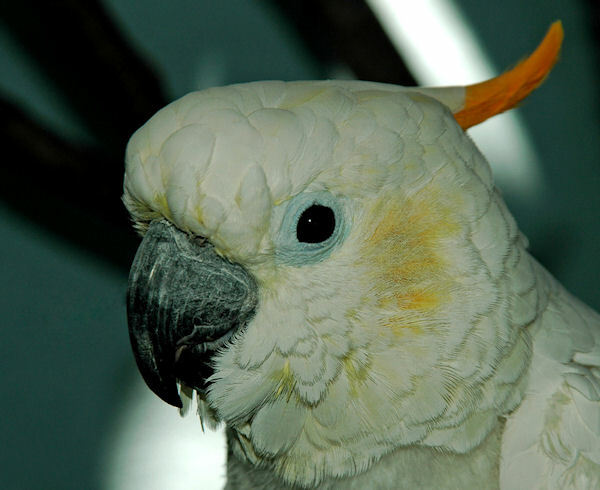 But interbreeding removes the distinctive traits of citron-crested cockatoos: the bright orange crest and the cheek patches. If mixing both subspecies is continued, one homogeneous species of lesser sulphur/citron crested cockatoos will be all that’s left. In my opinion it is a pity to lose a species that so clearly looks different than its closest related species. Currently it is hard to find pure citron-crested cockatoos in captivity as many have one or more sulphur-crested ancestors. Because of it’s expensiveness and rarity the citron-crested cockatoo not common as a pet. Some zoos or breeders keep this species as a novelty. Hybrids are also kept as pets. In behavior and needs this bird does not differ from the Lesser Sulphur-Crested cockatoo as it is the same species. Read all about the Lesser Sulphur-Crested cockatoo here.